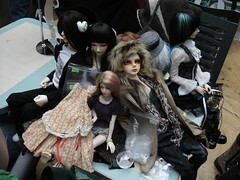 This past Sunday I had the chance to meetup with some BJD owners from my own stomping grounds – Toronto. It’s a rare occasion that I’m not working on a weekend so when this opportunity popped up I braved the rain and took Moe-chan and little Médée out to meet some new friends. We met up at the Village by the Grange in downtown Toronto, which has a food court area with lots of seating and there’s an area with a glass ceiling so there’s natural light which helped with taking pictures. It was funny because as a few people came back with food, then let their dolls chill out on the table and ate their food on a ledge in the corner because they didn’t want to risk getting their dolls dirty. Oh, we’re a funny bunch! 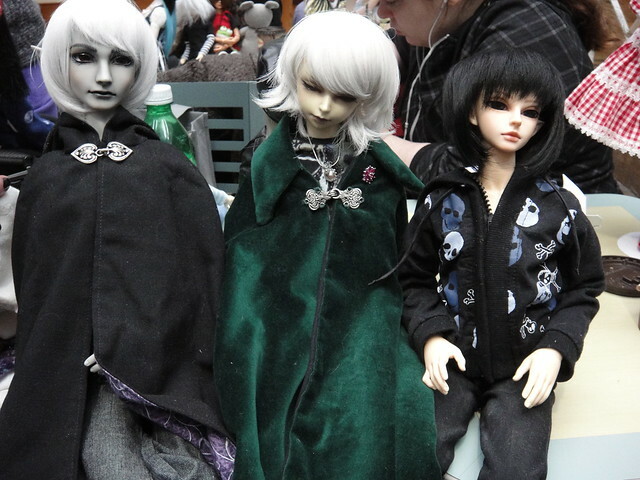 Left to right Grey skinned Long who is called Rubeus, Shiwoo Dreaming Vampire in a green cloak who is Ryu, and Lu-Wen who is called Loki belonging to Joy from Den of Angels. 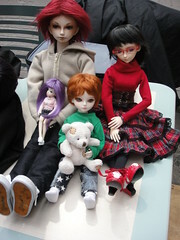 I didn’t want to bring my resin kids downtown on the subway so I had decided to bring a Dollfie Dream (or 2!) since they are lighter, and pretty much indestructible. 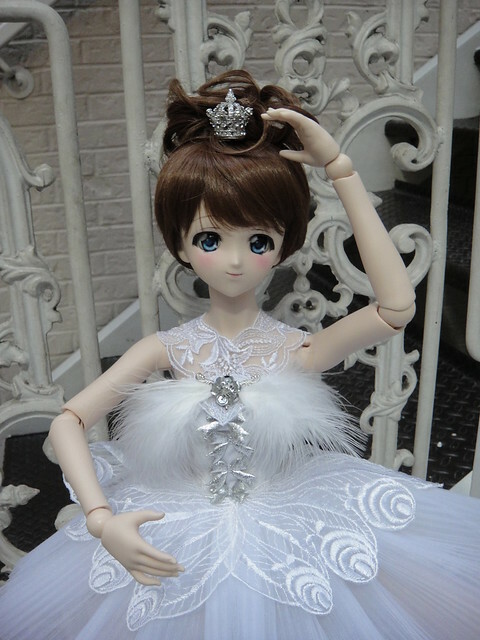 I packed Moe with her White Swan outfit since I was sure it would pique some interest with her ballet feet, and Médée (who is just so damned cute!). We had an interesting time comparing these 1:4 scale dolls since their bodies and heads are so obviously different! 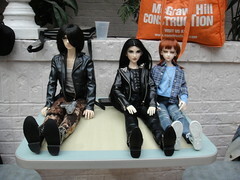 Médée’s head looks humungous next to these dolls, but that’s because DD’s and MDD’s can interchange heads. Here are a few more pictures, or check them out in this set on Flickr. Click on them to enlarge them! 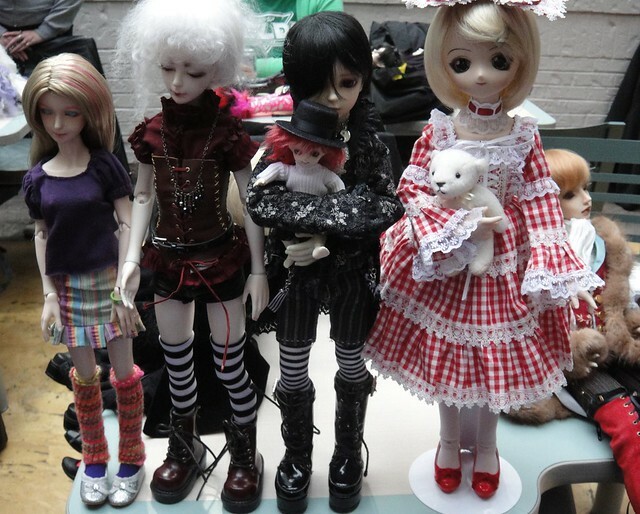 Even though this meetup was mostly resin doll owners, I had a nice time chatting with them about different doll companies, their stories/ character profiles for their dolls and picking each other’s brains about where to get cool outfits. I’ve been warned that some people get uppity about the fact that DD’s aren’t “real” BJD’s because they aren’t resin, but I didn’t feel any negativity towards the fact that I had brought vinyl dolls at all – perhaps because people in the doll community know how pricy these can be? 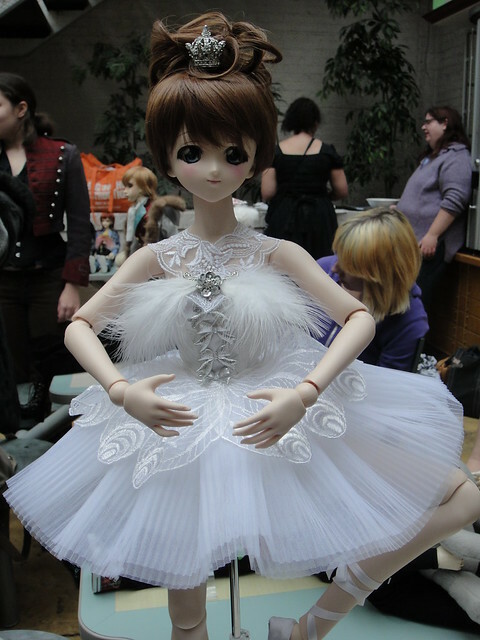 Quite a few commented that they had never seen a DD in person before and were quite captivated by my girls. I think that if you’re going come out and meet other people you have to have an open mind, and you certainly can’t be condescending or rude to other doll owners simply because something doesn’t suit your own personal aesthetic. 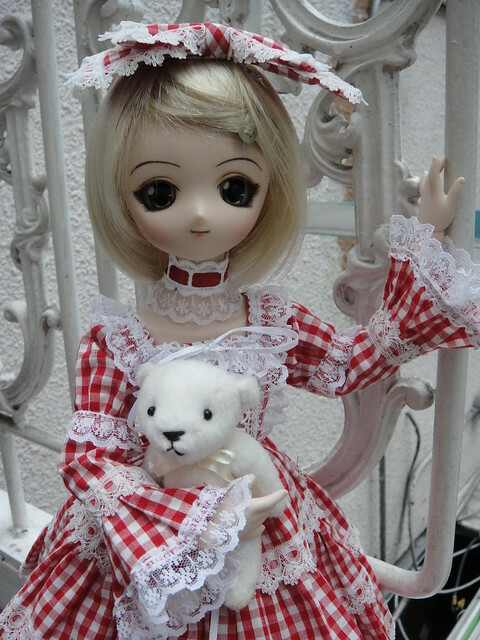 This entry was posted in BJD Misc, Doll Meetup, Dollfie Dream by archangeli. Bookmark the permalink.